Some of you may remember how word of mouth marketing worked in the years prior to the internet. You have a particular purchase in mind, and you call a couple of your friends on the phone to get their opinions on different brands, dealers, or providers, and you don’t make your decision on the purchase until you have your Dad’s approval. Back then, there weren’t a lot of different varieties of each product to choose from, because, heck, how many friends could any one person have with opposing thoughts about what you should buy? Can you imagine how few options we had before the proliferation of the telephone? The first Sear’s Catalogue in 1888 was a one-page flyer selling watches and jewelry. Back then, your Dad’s opinion was about the only one you could get before making a purchase…much less the only one you would need. 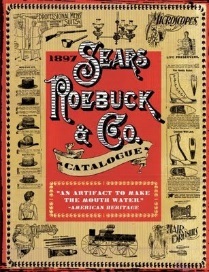 By the early 1900’s, as telephone switchboards began to connect the masses, Sears, Roebuck and Co. shipped full-color and textured catalogs in both spring and fall, which included hundreds of products in dozens of varieties. It was almost too much to choose from, in that day. Of course, now, you can research and buy just about anything you can dream about. And, with social media becoming ubiquitous across the far reaches of the internet, we have an unlimited supply of opinions about every iteration of every item available on the planet. Our choices are no longer limited to chocolate or vanilla. There are endless variations of every common (or uncommon) item imaginable, and selecting one from more than hundreds of choices would be nearly impossible without social media. I have an old friend I knew 30 years ago, with whom I haven’t communicated since high school, but who friended me on Facebook. When I’m in the market to purchase something specific, I find myself reading his posts for his opinions about those products he bought in the past, and I don’t even really know this guy anymore. Taking that a step further, Google now includes results based on comments, posts, etc… made by your Google+ contacts pertaining to your search topic. It’s called “Search, plus Your World,” and it pulls in Google+ posts, photos, comments and other information shared with you (privately or publicly) by your own contacts from Google+ Circles. So now, your friends can help you make that purchase decision without even knowing you’re interested. You get your 3rd party endorsement from someone with whom you share at least some interests, else they wouldn’t be in your circles. Look what Facebook is doing with their “friend endorsement” ads stuck right in your news feed. As much as this one gets on my nerves, I still look at them, and I’ve even followed one of the links. The other day, my cousins from the west coast must have “liked” a page about pasta, and I was notified that they like pasta. I like pasta myself, so I followed the link to see what all of the excitement was about. It was a pretty interesting site with recipes and tips about pasta, but I chose not to “like” them to keep my opinion to myself. The funny thing is that I have liked a myriad of FB pages in the past, and I can’t imagine the kinds of suggestions my friends are getting from me on their news feeds. The internet (and social media marketing) has certainly expanded the concept of Word of Mouth Marketing. A recent study, highlighted in this awesome infographic by Michelle Do, cited that “78% of people trust the recommendations of other consumers – while only 14% of people trust advertisements.” This statistic probably hasn’t changed much since 1894, when Richard Sears began including satisfied customers’ testimonials in his catalogs. However, the numbers are even more important today, because of social media and the ability to get such a large number of opinions from such a diverse population, all right here at our fingertips. Set up your social profiles and link them on your site. Actively acquire client testimonials and post them on your website. Increase your social engagement and followers on Google+ and Facebook. *Pro Tip: A good way to do this is through creative social campaigns, posting interesting, relevant content, and involvement in communities. Encourage referrals through an incentive program. Respond to negative feedback and make a good faith effort to make it right. How have you seen marketing evolve, and how have you adapted? Join the conversation below!